Ever since we started encouraging parents to have their own herbal garden, one parent came forward to share her experience and tip for set up your own garden. My mom has avid interest in plants and our interest in gardening is inherited from her. As we grew up my parents planted saplings of coconut, mangoes, tapioca and many more. I and my brother took turns to water all the plants and the energy was irresistible. The plants that were so small are now tall trees…Today not only all are pickles, thoku, mango bars are made out of the fresh mangoes and some amount of coconut oil are made out of coconut that is yielded from our trees but we also give it away to our friends and relatives. Accessing food that are healthy is biggest challenge we face today. “Food is your medicine” as we believe and give our children all the vitamins, immunity building substances, minerals etc but today that’s far from reality. We are not devoid from getting fresh vegetables, so we started to grow naturally. With all raising buildings we dint have adequate sunlight, so terrace gardening was the only option. 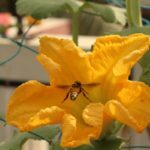 Watching your seeds sprout and growing you find enrichment and the glory of having to pluck something form your kitchen garden is irresistible. Soon we started noticing some tiny ants construct their homes on mango trees. These tiny creatures live in so much harmony that their nests are so beautifully engineered binding the leaves together like a cluster and forming a nest chamber. Interestingly these ants kill other insects, pests and act as pest control for plants. Traditionally in kerala farmers have used ants nests (Puli urumb) as pest control for vegetables. It is quite interesting that we learn so much from nature in the process. Not all seeds germinate and are self sufficient in terms of our requirement but we are thankful for nature’s contributions, for what we are able to consume from what is grown today, for how exotic our yard has turned out to be, for all creatures who has found habitat in our garden, for all the new things that nature has taught us in the process.. My 3.8yrs young gardener is already exploring garden and asks appa, do you want shankpushpa or chethipoo? We started converting kitchen waste to compost which is one of the best soil nutrients. Its almost like a magic to see garbage transform into so wonderful “black gold”. World is on the brink of natural disaster with polluted environment, earthquake, bad health, droughts, farmers selling kidneys to clear debts, committing suicide what not? Our actions have not just impacted climate and planet but all species. If every house hold thinks of retaining some precious greenery around, let the trees flourish again, try to grow edible plants in small space, increase soil fertility with organic composting, we are doing our bit to live in harmony with Earth. Society is gradually turning into soil and waking up to the fact that a small piece of land, a backyard ,a balcony , a roof top or a terrace can produce so much. If there is no yard, there is power when people come together and do community gardening in apartments. It will be great to see schools take this initiative to enlighten children with wonders of nature. When I walk into office campus I wonder why so much space is wasted with shrubs and lawns instead of edible plants.. Let us work for the benefit of all species, bigger self, our family, our friends, generation after us and “mother earth”. With little bit of patience, time and care to nurture, it is fascinating to see what nature can give us back in abundance and in this process with nature we can witness the whole “cycle of creation”. Vegetables require direct sunlight, so it’s best to grow them on a terrace or a yard where there is adequate sunlight. On a terrace its better to be done after waterproofing. We can grow them in a patch, grow bags, sacks, gunny bags, waste buckets, pots and any containers. For soil mixture mix equal proportions of soil, sand, compost made out of kitchen waste, dry cow dung powder. Seeds – There are various types of seeds (Organic, Hybrid, Heirloom , GMO). This link gives good informationhttp://www.underwoodgardens.com/what-are-heirloom-seeds/#.VuGJWE1f0iR. Be careful to choose the right seeds. 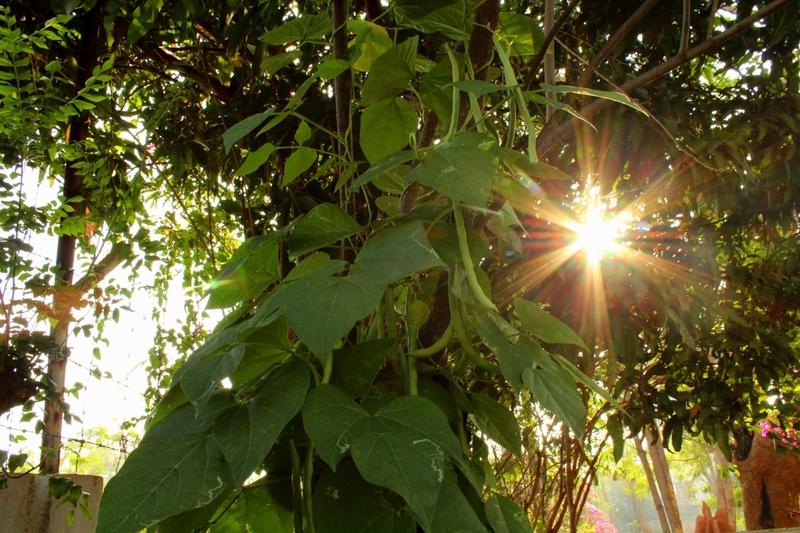 Soak seeds in water and seed them for climbers like ash gourd, snake gourd, cowpea etc. Others can be seeded immediately in soil. As the seeds sprout, make sure they are not over watered. For pests – Neem oil mixed diluted in water sprinkle them on plants to keep insects/ aphids away we can also mix small amount of detergent to this. Garlic / ginger/ green chillis grinded together diluted in water and sprinkled over plants keep pests away. 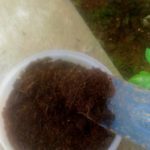 Don’t throw away your kitchen waste, make your own compost with Kamba (Earthen pots) and use that every fortnight for your plants. . http://www.dailydump.org/. There is enough help available online for all. There is an app called “garden calendar” that can be downloaded, It guides to grow plants according to phases of moon and forces of nature. Most of the time we do not know what is moons influence on nature so this gives recommendations on favorable days for gardening activities, transplanting, seeding etc. Lastly as we all know plants can feel, so give them all your affection…Nature does the rest.. Happy Harvesting!! Author HridyaPosted on January 25, 2017 Categories Spiritual Trees & Herbs1 Comment on Glory of Gardening!! 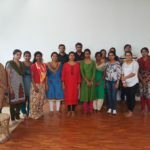 Start the herbal garden to protect your family, environment and above all, kids at home inculcate the good practice to plan tress and also pass on the ancient wisdom to this life saving herb. Coriander is one of the ancient herbs in treating many ailments like obesity, menstrual issues, controlling kaba and many more. (this is the last option). 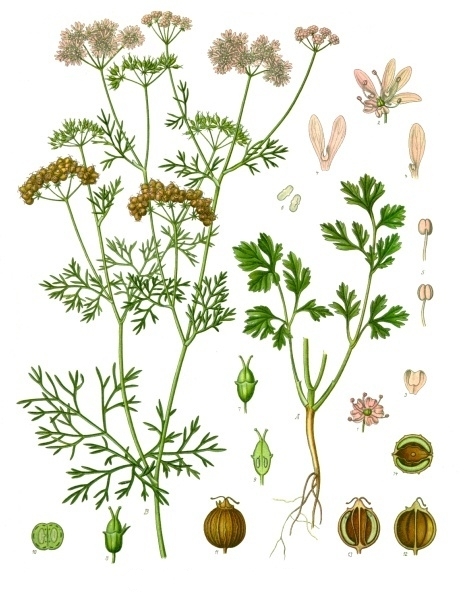 Coriander seeds are easily available in most of the organic stores. Make sure it is native variety, not hybrid or GM seeds. You can also get in touch with Greenhands project for seeds. Sowing coriander seeds should be done in a even manner as harvesting and watering becomes difficult I’d the seeds and sowed dense in a single place. Better to draw line like markings in the soil and sow the seeds evenly in every row giving space between each row. Porous soil is best suited for coriander. Make sure the u can stick ur finger inside it. Tats the porous consistency. A mix of coding and vermicompost is an added advantage. Use sprayes for watering and the stem is very fragile and too much watering is not gud for the plant. All it needs it is wetness. Important note: Use of scrap water bottles, scrap tubs trays are the best as coriander has very small root so it doesn’t need a shallow pot. I prefer hanging them by kitchen window to get a cilantro breeze inside the kitchen and hanging these greens is the best way to save space. Cosmic healing with birth stars and trees. Energize your soul with nature’s greatest gift to mankind, trees! Understanding the creation of this whole cosmos is a mystery. Scientists have gone too far in the recent times to give us various theories. Every time they discover a theory, it either supersedes or contradicts their past theory. If we go back in time, It is astonishing to see how yogis or siddhas gave us in-depth knowledge about the creation of universe through various texts/scripts/poems. There is lot of research about such questions going on in the scientific field currently. How our ancestors knew about it might sound mysterious, but if we dig deeper, we will know that it is through their mystic power acquired by their sadhana and various yogic practices such as meditation, astral travel, and so on. Before we go to the Birth star and their respective trees, we need to understand the connection better. Once we know the meaning, the practice of hugging trees becomes meaningful. There is a famous saying in siddha’s text “Andathil ullathu pindathil, pindathil ullathu andathil” Which means, whatever is in the cosmos is in our body, and whatever is in the body is in the cosmos. This is the fundamental fact our ancestors realized long ago. It is a known fact that all the living creatures are made of 5 elements of nature. They are fire, water, earth, air and space. Science says, we are all constantly influenced by heavenly bodies that surround us. Our ancient text clearly documents the fact that, nearest heavenly bodies such as planets and satellites affects us. The nearest bodies for us are, Moon, Sun, Mars, Venus, Mercury, Jupiter, Saturn, and two lunar nodes known as Ragu and Kethu. We are also affected by moon and stars at night. It is at this time, the conception starts.The subtle vibrations and light that fall on our earth supports two things, creating new life form and healing those living and non-living creatures. These vibrations are changing continually, because the heavenly bodies are also moving in time. It is during such time, new forms of life are created and these life forms have their planetary and stars properties. This is where Astrology starts. At first, it was started to understand the nature of seasons, prediction of flood and famine and so on. Later, as more and more people meditated, understood the nature better, they also realised that all the living and non-living creatures are also affected. Thus, the concept of medical astrology was evolved. In the past, there were no sophisticated machines or techniques to scan our physical bodies. The healer who would either be a psychic or a mystic or an astrologer would simply look at the birth chart of the individual and tell us what issues we might face now or in the future.The treatment for the illness would be in the form of rituals, lifestyle changes or give the patients combination of herbs or gems. For Example, for three people with the same mental problem, they might give one person a Moon stone, second person a panchagavya ghrita and for the third person, pranic healing and so on. Why there is so much difference? It is because our ancestors strongly believed to treat the source of a disease than the symptom. So the same illness might have originated at different levels for each patient and the treatment has to be issued wrt the planet where it has originated. In order to know more about the illness, we need to understand our bodies very well. The physical body we see is just a one of the three layers, known as, Sthula Sharira. There are other two layers called as Sukshma also known by various name such as astral body, subtle body, pranic body or Linga sharira, where the mind and intellect resides, and finally, the causal body, our doorway to the higher consciousness. Going back to the heavenly moving bodies and it influence on us, we need those healing energy heal our three layers of body from higher species, plants and trees! 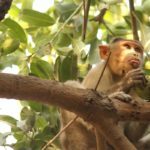 We can confidently say trees are far more advanced than animals, based on scientific study done in recent time. Number of genes in an human DNA ranges from 20,000 – 25,000, whereas simple traditional rice has 46,000 – 55,000 genes in their DNA. Surprised! Higher the genes, higher they have evolved, With common sense, we know that trees live longer than humans and they understand a lot more than we do about nature. In fact, there are trees which are 32,000 years old! The highest lifespan in an animal kingdom is only 300 years that of a tortoise. Biologists believe that trees do not share the same origin as us.And we also now know that they are lot more intelligent than us having higher social skills.They understand our environment better and few can even dance with music ( this is demonstrated by Botanist Dr Pradit).Trees as they are more evolved than us, can understand us at all three levels of the body.There is an ancient tree called “Karpaga vruksham” or “Kalpavriksha” or “wish-fulfilling” tree which can move! Only nature knows how!! Since trees are far advanced, they absorb more healing energy than anyone else. That is why our ancient texts are flooded with reference of siddhas or yogi who meditated under a tree and reaching nirvana or enlightened state. These enlightened souls, were able to identify various location, symbols, gems stones, and trees that would heal all the layers of the human body of a person born at a particular time. They identified trees for 9 planets later they identified trees that would cover 30degree of the zodiac called as Rasi Trees, Later they identified 27 stars that affects us and their trees, and they even went further in each star to divide them into 4 parts called as padas and found its tree for respective pada. Hence, 27 x 4 = 108 trees. In the olden days, they use take classes under the tree. Lucky were those who had the privilege to sit under a tree for their education. It is said, chanting under neem tree produces more powerful vibration, One of the ancient texts (vedas) quotes that neem tree was born while chanting a mantra or primordial sound with certain rituals..
Now, we know a little about trees, so how to do we seek their blessings? Again we have to go back in time to find those answers. In the olden days, when a baby is born, the father would consult a family astrologer to know what is the destiny of the baby and they would recommend a tree as the star tree and gemstones. That is why the activity of writing the birth chart was one the Samskara like swarnaprashana, tonsuring or ear piercing. The father would then take a small portion of the umbilical cord and bury it and plant the star tree there. Later, we forgot this process, and they used to bury it in schools and temples. Why? They all had trees. Now, we completely lost our tradition. That is why each temple in ancient times always had a tree. Or to put it right, they found the tree and build the temple around it. So that people who walk-in receives the healing energy. Also, these ancient temples always has a siddha or yogi samadhi. 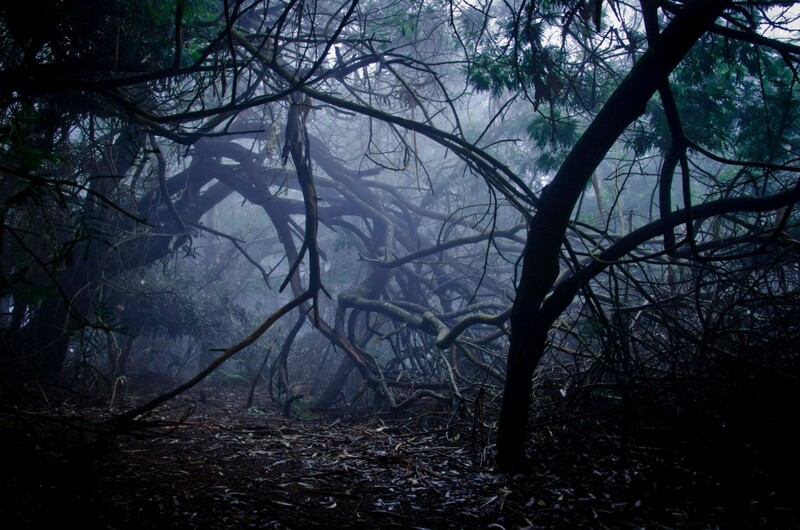 These trees would emit the blessing from those souls to us through trees. These temple trees are called as Sthala Vriksham. For example, the mango tree at the Ekambershwara Temple at Kancheepuram, also known to possess the energy of earth element (which is one of five elements of nature) is said to be 3000-3500 year old! The mother would keep a vessel of water in silver or copper or gold near the baby’s head while sleeping, in morning time, they would pour the water to the birthday star plant. She would take her baby under the tree during day time to play with them. The plant that is just born out of baby’s entry into the world would produce healing energy for him and guide him in this dream and intuition. In today’s busy lifestyle, it is hard to spend time with trees, esp if there is no trees near by. It is necessary to spend time with our respective star-trees during our birthdays because birthdays (wrt star) is the weakest time in a person’s life and we when we are weak, we have to be in the safest place which is our birth tree! There are 108 trees in total for 27 nakshatras and for each of the 4 padas of a nakshatra. Some of the trees are very rare and hard to find, so we have also listed 27 trees for each nakshatra, that would cover all the 4 padas for that particular nakshatra. You can use, either or both of the trees as per the proximity. More than finding one, try to plant one! Given below is a place at Pondicherry, which not only has all 27 trees / nakshatra, but also 12 trees as per Rasi, 9 trees as per planets, and 60 trees for each Tamil Year cycle. We will continue to find those hidden place and update the blog. We might not have details regarding all the trees but we are in constant process to update the details. If you know more about trees, please do share it with us. There are usually more than 1 tree for a star – let us not restrict ourselves with the false concept of one tree per star or pada. We will later share the trees/plants wrt to Rasi also. 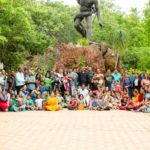 Vijay Ghanabathi – who shared the Pondicherry location for those healing trees. Tamil Name: Kambli chedi, Mussuketi, Musukette. Scientific Name: Strychnos nux-vomica L.
Hindi Name: Champa (North-East India), Lal velchi (North-West India), Karpura chakkara keli (Southern India). Scientific Name: Annona reticulata L.
Author Velu JayaprakashPosted on April 11, 2016 August 16, 2017 Categories Ancient Wisdom, Spiritual Trees & HerbsTags birth star, Medical Astrology, Nakshatra, trees25 Comments on Cosmic healing with birth stars and trees. Lots has been mentioned about the benefit of Arjunarisht for heart related problems. Here are a plethora of gains by thisone herb,please read on may be somewhere it will help you. The use of arjuna reduces excess bile, cures acidity, and brings stability in blood circulation. It brings relief in blood bile, acidic bile and other related disorders. Due to its bitter taste, it treats cough, urine related disorders and is a good suppressor. It is astringent and febrifuge. It treats various toxins and strengthens the hearts functioning. Arjuna, Shirish and Palm tree are helpful in leprosy, gonorrhea, paleness and cough and are a fat suppressor. Arjuna tree, ‘ashmbheda’, ‘apamarg’ and ‘gokhru’, help in treating gastric disorders. The lithiasis sugar treats urinary disorders. Arjuna, syzygium cumin, licorice and berry, all are beneficial in abscess, inflammation and other diseases. English: Arjuna| Sanskrit: Arjuna, Dhaval, Samba, Indradadu, Kakubh| Hindi: Arjuna, Kahu Gujarati: Gholo, Sadaro, Sajar |Marathi: Sadaru, Arjun, Sadara| Bengali: Arjun, Gach |Punjabi: Kau, Koh |Telugu: Charramachi Dravidi: Vella, Bhatti |Kannada: Kammutte |Marwari: Arjuna. On dry mountain ranges, on the bank of rivers, lines of trees, growing up to 80 feet high, the green color bulbs appear as it’s warriors, armed with an infinite number of weapons in their quivers. These warriors have gathered to eliminate the various disorders and diseases, as their enemy. Arjuna tree is found in the forests. The flowers grow in ‘Baisakh’ and ‘Jyeshtha’ months, and fruits develop in the winter season.Its main trunk has a round shape with a height of 10-20 feet. Its outer layer (bark) is whitish in color, smooth, and around 1/3rd of an inch thick. The wood is red color on the inside. The bark shed its layer once in a year as the snake sheds its skin. Its leaves are 3 to 6 inches long, 1 to 2 inches broad, and on small branches are smooth and costate. On the back side of the leaves, it carries two green color glands. The flower is small, green-whitish color, and grows up in clusters. It is odorless. The fruits are long, oval shaped having 5 bulging curves with chambers. The fruits are seedless. Gum of the Arjuna Tree:The extract of arjuna is clean, golden or brownish in color and transparent. Chemical Composition of Arjuna Tree:The husk of arjuna has various chemical compositions. It has 34 percent of calcium carbonate and other alkalis include sodium, magnesium and aluminum. Due to excessive calcium and sodium, it helps in strengthening heart muscles at the minute levels. 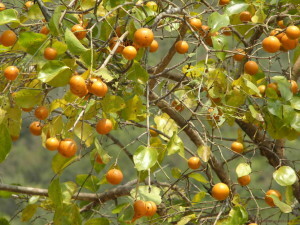 Qualities of the Arjuna Tree:Arjuna is cool, good for the heart, astringent, treats body toxins, blood disorders, gonorrhea, bile, cough, fat and ‘pitta’. Arjuna bark in different composition gives strength to the heart muscles. It is good in supplying nutritious elements to the heart. When the muscles of the heart become powerful, the heart beats are strengthened with more regularity. The heart beats will reduce, with contraction in blood ducts, which regulates blood circulation. The heart gets strengthened and stimulated. The blood flow (pressure) within the blood ducts reduces, which treats hydro-related problems. Its use ensures proper contraction of the blood resources so that the heart uniformly distributes blood in the body and also pulls blood sent over different parts of the body back into the heart. Hence, its use is beneficial in heart disorders, passiveness in blood vessels, bodily inflammation, slowness in nerves, breath and cough problems, particularly chronic ones. The use of arjuna reduces increase in the ‘pitta’ and acidity and generates stability in the blood circulation. It is helpful in case of blood bile and acidic biles. Since it is astringent it treats cough and urine disorders. It also treats fever and strengthens heart functioning. It is anti-toxin. ‘Arjuna’, ‘Shirish’ and palm tree are good for leprosy, gonorrhea, paleness, cough and fat. Arjuna, syzygium cumini (Jamun), liquorice and berry, all are good for abscess, as well as sexual diseases.Medicinal . *Treatment of Recurrent Mouth Ulcer (Stomatitis) with Arjuna Tree:‘Mukhpak’ – When the powder of its root is mixed with eating oil and gargled with hot water, it treats ‘mukhpak’. *Treatment of Ear-ache with Arjuna Tree:When 3-4 drops of juice from its leaves are put in the ears, it treats ear-ache. *Treatment of Melasma on the Face with Arjuna Tree:When its bark is crushed finely and mixed with honey to put a paste of it on the face, it cures melasma. *Treatment of Tuberculosis Cough with Arjuna Tree:When the powder of the bark of arjuna is mixed with seven pinches of ‘vasa’ leaves and taken with 2-3 grams of honey, sugar candy (misri) or cow ‘ghee’, it treats TB cough with blood. When heart beats exceed from 72 to 150, take one glass of tomato juice, with one spoon of arjuna bark powder. Its regular use normalizes heart beats. A spoonfull of fine powder of broad bark of arjuna tree, when taken with one cup of milk without cream, regularly in morning and evening, treats all heart ailments. It gives strength to the heart and treats weakness. The increasing heart beats too are reduced to normalcy. Roast 20 grams of wheat flour in 30 grams of cow ghee. When it turns pink, put 3 grams of arjuna bark powder and 30 grams of sugar candy (misri) with 100 grams of water. After the mix is properly prepared, take it in morning. Its regular use treats heart pain, increased heart beats and anxiety. Mix powder of bark of arjuna tree with flour and mix with honey and sugar candy (misri). These treats severe heart problems. The weakness of heart and inflammation generated due to it, could be treated with arjuna bark. Mix 6 to 10 grams of arjuna bark powder with ‘gur’ (jaggery) and milk and boil it. Filter it and drink. It stops water content of lymph filling in the blood vessels. This treats heart inflammation and hence, the weakness is treated. Take 50 grams of arjuna bark (if wet is not available, take 50 grams of dry bark) and boil in 4 kg of water. When the mix is reduced to one fourth, filter the decoction. Take 50 grams of cow ‘ghee’ and mix 50 grams of arjuna bark and the other ingredients cooked earlier. Heat it on a slow fire. Later, cool it. Now mix 50 grams of honey and 75 grams of sugar candy (misri) and keep it in china clay pot or glass jar. Take around 6 grams with cow milk. This will strengthen the heart.Weakness of the heart, excess heart beats, swelling or heart enlargement problems are best treated with this mix. If a person has suffered heart attack earlier, take the above decoction 40 ml in morning and evening. It is a miraculous heart and cardiac tonic. For complete benefit of the mix, prepare the decoction in milk. It helps in the treatment of angina pain, heart beats and anxiety. 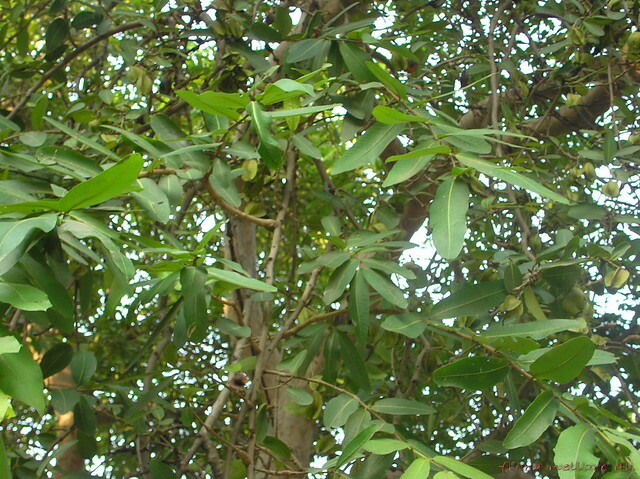 The powder of arjuna bark, when filtered with cloth is more effective as compared to other medicines. Chew it, keeping it on the tongue. It was found equally beneficial as sorbitrate pill. When the pulse rates or heart beats are very low, keeping it on the tongue starts giving relief immediately. 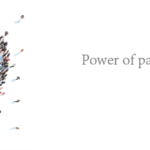 The medicine gives permanent relief and it does not have any adverse impact. It is more beneficial as compared to the allopathic medicine digitalis. It is beneficial in cases of high blood pressure. If swelling or inflammation has developed due to the high blood pressure, it gives relief. Treatment of Excessive Urine with Arjuna Tree: To stop the problem, take 40 ml decoction regularly in morning and evening. Treatment of Blood Diarrhea with Arjuna Tree: Take the finely grinded powder of arjuna bark, 5 grams, and warm it on a slow fire with 250 grams of cow milk and around 150 grams of water. When only milk is left and when its temperature is reduced, comfortable to drink, mix with 10 grams of sugar candy or sugar. Take the mix regularly in the morning, which treats all the heart ailments. It is especially beneficial in gastric troubles or heart ailments. This milk, mixed with arjuna bark powder is also helpful in chronic fever, blood diarrhea and blood bile. Treatment of Blood Blennelytria with Arjuna Tree: Take arjuna bark powder 1 spoon and boil with mix of 1 cup of milk. When the residue remains half, mix sugar candy and take three times a day. Treatment of Gonorrhea with Arjuna Tree: Take arjuna bark, neem bark, amliki bark, neelkamal and turmeric, all in equal proportions, around 20 grams and mix with 400 ml of water. Boil till residue remains 100 ml.Take the mix with honey in morning and evening, which treats gonorrhea. Take leaves of arjuna, quince, syzygium cumini, ‘mrinali’, ‘shriparni’, ‘mahendi’, ‘dhai’ and mix them with ‘ghee’ and salt. It is much beneficial in the disease. Treatment of Shukrameh with Arjuna Tree: The patient should take the decoction of the arjuna bark or white sandal regularly in morning and evening, which treats the disease. Treatment of Urine disorder with Arjuna Tree: Take 40 ml decoction of arjuna bark, which treats urine disorders. Treatment of Fracture with Arjuna Tree: When the body part is plastered due to broken bone, take finely grinded powder of arjuna bark, one spoon with 1 cup of milk, which strengthens bones. On the broken bone, use paste of its bark mixed with ‘ghee’. It also helps speed union of the fractured bone. Treatment of Inflammation with Arjuna Tree: It effects on the kidney and helps in proper urine formation. It helps in the treatment of excessive water content in the body parts besides heart ailments. Treatment of Obesity with Arjuna Tree (for Weightloss): Take powder of arjuna root bark and ‘gangeran’, two grams each regularly in morning and evening, which treats diseases related to obesity. Treatment of Blood Bile with Arjuna Tree: According to Charak, soak Arjuna bark for entire night and in the morning filter the water and prepare a decoction. Its use is helpful in blood bile. Treatment of Leprosy with Arjuna Tree: In blood disorders and leprosy, take one spoonfull of arjuna bark powder with water daily. Also, its bark, when rubbed with water to prepare a paste, is helpful. Treatment of Fever with Arjuna Tree: In fever, take around 40 ml of its decoction, which treats fever. Treatment of Abscess with Arjuna Tree:Finely grind arjuna bark and prepare a decoction. Wash injuries and abscess with it, which is beneficial. Take powder of its root, one spoon with milk, which treats bluishness due to some injury. Treatment of Chronic Fever with Arjuna Tree: Take one spoon full of its bark with ‘gur’ (jaggery), which treats chronic fever. Treatment After Heart Attack with Arjuna Tree: Take fresh bark of arjuna tree, dry it in open and prepare a powder. Take 250 grams of milk and an equal amount of water and boil it. Put three grams of arjuna powder (partially filled tea spoon) in it. After boiling, when the milk remains half of the quantity, remove it from the flame. Filter it and drink, which treats all heart problems and stops heart attacks. It is very effective medicine after heart attacks. Other Procedures:Take 12 grams of arjuna bark and boil with 250 grams of cow milk and an equal amount of water. When it remains half, mix 10 grams of sugar candy, which treats all heart troubles. In fact, arjuna is a miraculous gift of the nature and we all should take advantage of it.